It seems like something wonderful to play. I am curiously enchanted with this tuning. I tried it with the tuning in E+F which I had mentioned above. It should be possible in other keys as well. I did not check which key in any default tuning would be suitable for retuning by yourself, if you do not want to buy a configurated Seydel. But if you are able to retune harmonicas, you easily might find out yourself. Anyway, a configurated Seydel is only 20 or 25 € (or USD 20) more than a default one, depending on which model you choose. A possible way of creating a Spanish tuning might be to combine two reedplates from two different harps, and a little re-tuning. The upper plate could come from any Richter harp blow-plate, unmodified. The lower plate could come from another Richter harp which would have to be altered. Examining existing Richter reed-plates, it is obvious that if we would want to convert a blow-plate to a draw-plate, then it should be a plate, where all notes are 3 semitones higher than the upper blow-plate. A C# E A C# E A C# E A (A major chord). This is our upper plate, as is. C E G C E G C E G C (C major chord). This will be our lower plate. 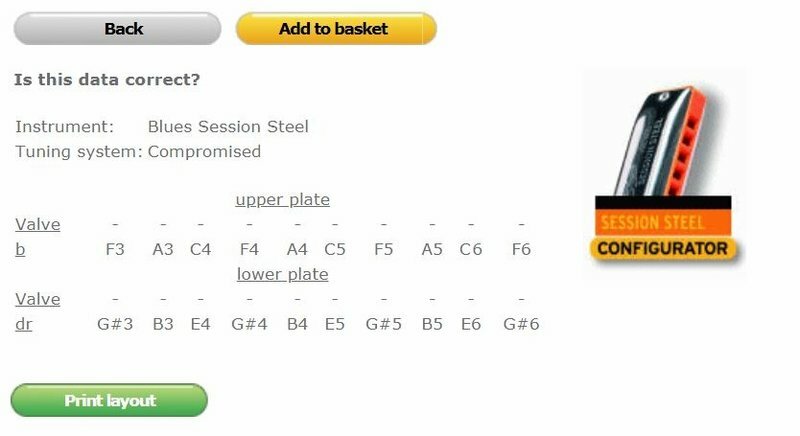 C D# G# C D# G# C D# G# C (G# major chord). 6 reeds retuned, of which 3 a semitone up (G -> G#), and 3 a semitone down (E -> D#). We now have a Spanish tuned harp in G# / A. The screw-holes don't have threads. We need to find some kind of nuts for this or find some other solution. The reeds are pointing in the "wrong" direction. Even so, they do sound pretty good that way. I just half-tested this, that is, without retuning and without screwing the reedplates. The harp was held together only by the two outer screws. It sounded... well, leaky, of course, but apart from that, not bad. Note: To get e.g. the E / F tuning, you should start with F blow as upper plate, and G#(Ab) blow as lower plate, 3 semitones higher (not 9 semitones lower). An easier way is probably to retune any Richter-tuned harp, maybe with a small modification in the upper octave. Option 1: It's a correct implentation of the original idea, but, although the lower 6 draw notes require only small alterations, the upper 4 require a lot more. Option 2: Here, the upper 4 draw notes need only small changes as well, and the chords will be correct still, but you won't have any bends on those upper 4 holes, neither blow nor draw. This one looks fine. Thank you. I think I will try it soon. Option 1 is to prefer in my eyes. Just the rising of 9d from F to B and 10d from A to D# is a harsh step of 7 halftones. It is to hope that this will not weaken the reeds over their capability. Your suggestion of changing blow and draw reedplates among different harps had already come to my mind too. (I recently considered about experiments with chromatics and double diatonics with slide as well.) I did not find time to check this thoroughly. But it seems to have potential for the one or the other modification without extreme retuning of single reeds. But I do not think that converting blow reedplates into draw reedplates is a good idea. Seems to me technically too awkward. I would rather look for a draw reedplate which comes nearest to the aim. But on a quick check I recognized that most of the Richter keys would need at least one or two reeds with a bigger range to tune up, at least up to 5 or 6 semitones in particular. The efficiency of the chosen basis depends on which keys you have available to retune (for recycling of unused harmonicas). Before you buy 2 new harmonicas plus the work of retuning you better buy 1 configurated harp from Seydel. I have lots of old Richter harmonicas in various keys around that I do not play any more. I just kept them as back ups. And it were a pity to throw them away anyway. But to try to sell they would not bring too much either. I can use them as a base for new tunings. So they might resurrect to a second life as a guinea pig. If I come upon something I really like, and which I would like to have in better quality, I can order a new configurated one, without the risk of not knowing what I will get. I shall report when it has come to any results.